Why should a Christian care whether they believe in Evolution or a young earth? Nathan Jones: Mike, what does it matter? Why should a Christian care whether they believe in Evolution or a young earth? How is that knowledge even practical to our daily lives? Mike Riddle: That's a great question. We don't get into a lot of churches to teach about the Creation because they don't see it as a real issue for today. Let me give you four points on why it really does make a difference. Point number one is the authority of God's Word. — When do we believe it? When do we not believe it? In other words, if we don't believe God is the creator of all things, then we can believe in Evolution. That is where a lot of people are. They try to combine the Bible with Evolution. Point number two is that Genesis is foundational to almost every single one of our Christian doctrines. — For example, Genesis give us the definition of marriage, that is between one man and one woman. If we don't believe Genesis is real history, what creates our definition of marriage? Well, we have to go with what the world says. Genesis also gives us a definition about the sanctity of human life. If you want to believe in abortion, you can just throw away Genesis. But, if you want to believe in the sanctity of human life, that we were made in the image and likeness of God and that we are fearfully and wonderfully made, that comes right from Genesis. Genesis tells us that we are not animals. In a biology classroom we are taught that humans are nothing more than an animal with higher intelligence, but if we accept the book of Genesis that teaches that mankind is fearfully and wonderfully made in God's image and likeness, then we're not animals. We are special. So, there's the first two points. The third point is a very important one, that without Genesis we don't have a Gospel. — There are really four parts of the Gospel. The central part of the Gospel is Jesus Christ. He is the main part of the Gospel. Jesus Christ, God, came down to this planet. He let His Son who became fully man suffer and die on that cross and be raised from the dead. But, why did Jesus have to shed His blood? We have to go back to the book of Genesis to get the rest of the story. The story starts with God's creation in six days and how in Genesis 1:31 God called it very good, perfect, no blemish. That's the first part of the Gospel and how it's all about God and His creation. The second part of the Gospel is Man. We're the problem. We're the ones who rebelled against God and defiled His perfect creation. We're the ones who fell into sin and became separated from God. So, the first part is God. The second part is Man, that we're the problem. The third part is Jesus Christ, which is God's solution to our problem. Then there's the fourth part, and it's a very important one, for it involves our response. It's not what we can do, for it is by grace we have been saved through faith. No, it's not what we can do as God has already done all the redemptive work for us on the cross. So, there are the four parts of the Gospel, and the first two are grounded in the book of Genesis. Dr. Reagan: That first point you made is one that I like to emphasize over and over and over again. The validity of God's Word is at stake here. If we can't believe the beginning of the Bible, then why should we believe the ending? Why should we believe in the Resurrection? Why should we believe in any part of it? W.A. Criswell, the former renowned pastor of First Baptist Church once said, "So many people today have a leopard method of interpreting the Bible. They claim the Bible is inspired only in spots, and they alone know those spots." 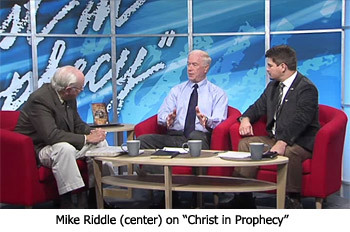 Mike Riddle: Then there is the fourth point, and that is the relationship of sin and death. — If we're believing in Evolution and that Evolution stands this idea of billions of years to create everything, and if this earth is billions of years old, then what was going on for those billions of years before Adam and Eve? The answer would be death, decay, and disease. All that would have been happening before sin came into the equation. A belief in Evolution and billions of years is a belief in death before sin. Why did Jesus have to go to the cross and physically conquer death? The origin of sin is an important issue that effects the Gospel. In the fourth segment of this Creation training series with Mike Riddle, he'll explain why the Big Bang Theory just doesn't work as a viable explanation for the origins of the universe. Do u believe in a Pre-Adamite creation?